Last year, I was commissioned to make a couple of large throw blankets for a couple who wanted to use them as employee holiday gifts. 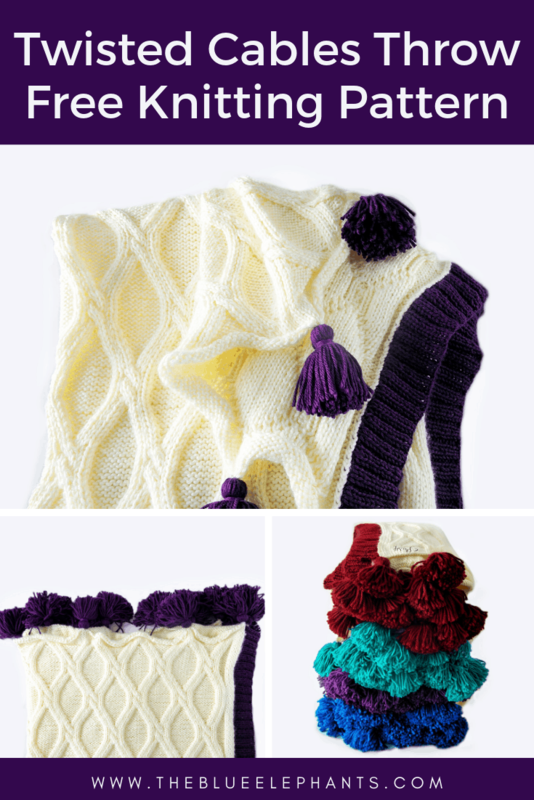 We talked about a few different design options and in the end, we decided on a chunky knit blanket pattern that was elegant and pretty, while also being super thick and plush. This blanket pattern features some really pretty twisted cables that are much easier to do than you would think. A simple pattern repeat creates this amazing texture. We were also able to make the blankets personalized and a little different from each other by working different colored borders and tassels. So, let get right into it! I was actually given an inspiration image to work from when I was coming up with this design. 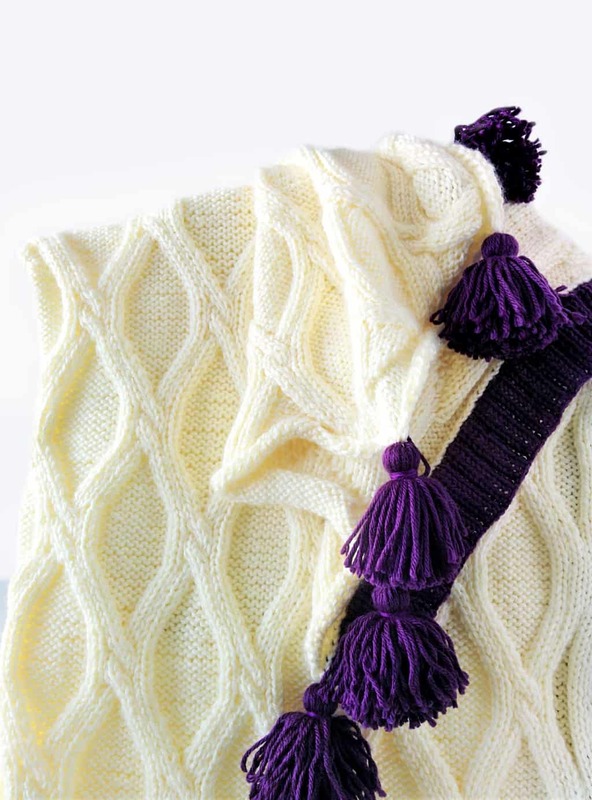 The main part of this chunky knit blanket pattern is made up of the twisting cables throughout the blanket. At first, looking at the design, I thought it would be hard to recreate and charting it out made it look worse! But I swatched it out anyways and it was much easier than I expected once I saw the pattern taking shape. I also included the chart if that’s more helpful to you. I love the way the finished chunky knit blanket turned out and how the cables twist around each other to create a look that is so luxe and elegant. The yarn is super soft, easily washable and even has a little bit of a shine to it that I just adore! Because my customer wanted 4 of these blankets and wanted them all a little bit different and special, I used different colors to make the borders of each blanket on two sides and matching jumbo tassels on the other two. 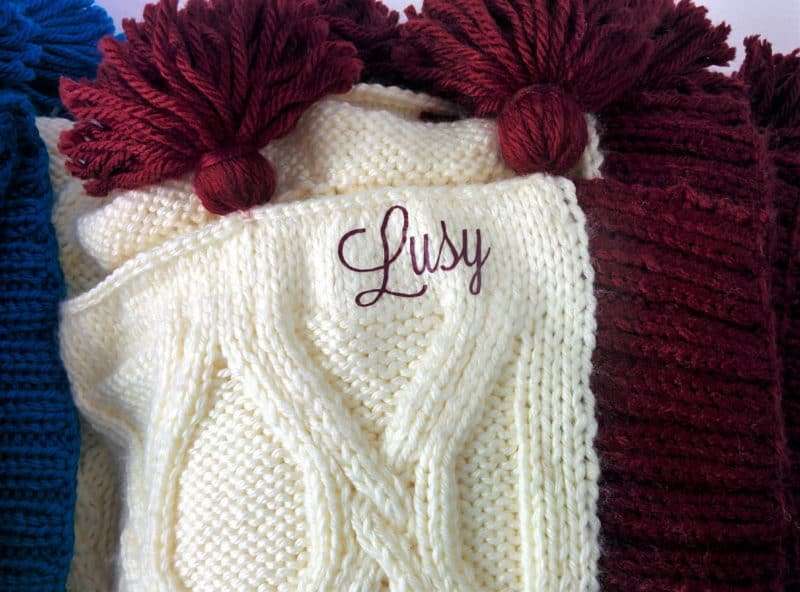 I also purchased some iron-on names in the same colors to personalize each blanket. I loved the idea of custom throws like this as Christmas gifts, and once I finished the first one, the rest were done much more quickly. Each blanket took me about 10 days each to complete, then I just had to block them! 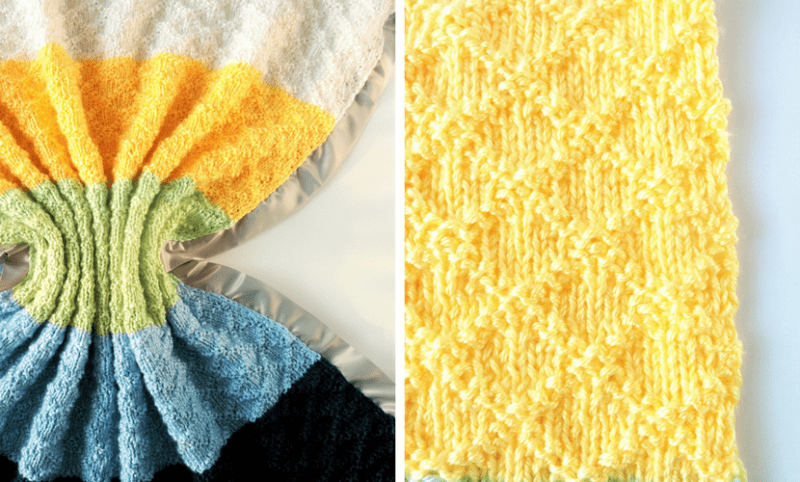 You can make these blankets any size you like with the blanket sizing guide above. K2F/P1B – slip 2 stitches onto cable needle, hold in front and purl the next. Knit 2 off the cable needle. 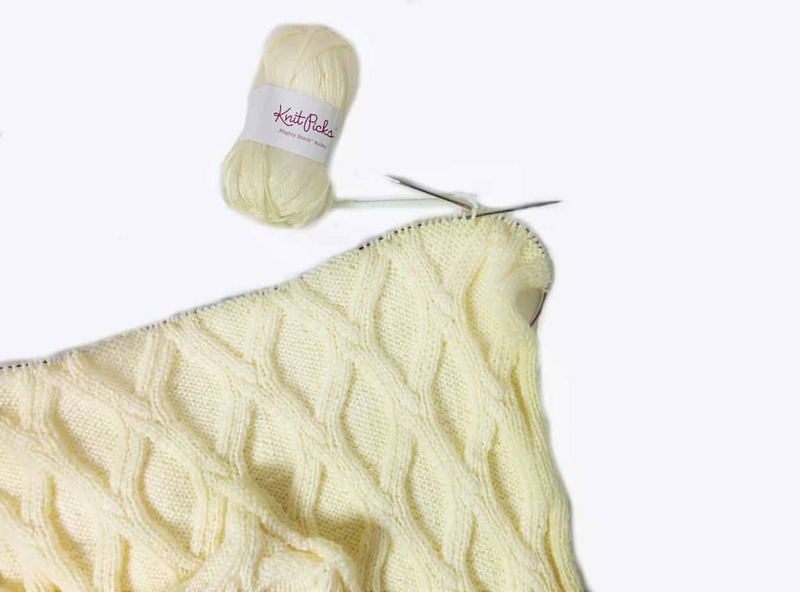 P1B/K2F – slip 1 stitch onto cable needle, hold in back and knit the next 2. Purl 1 off the cable needle. 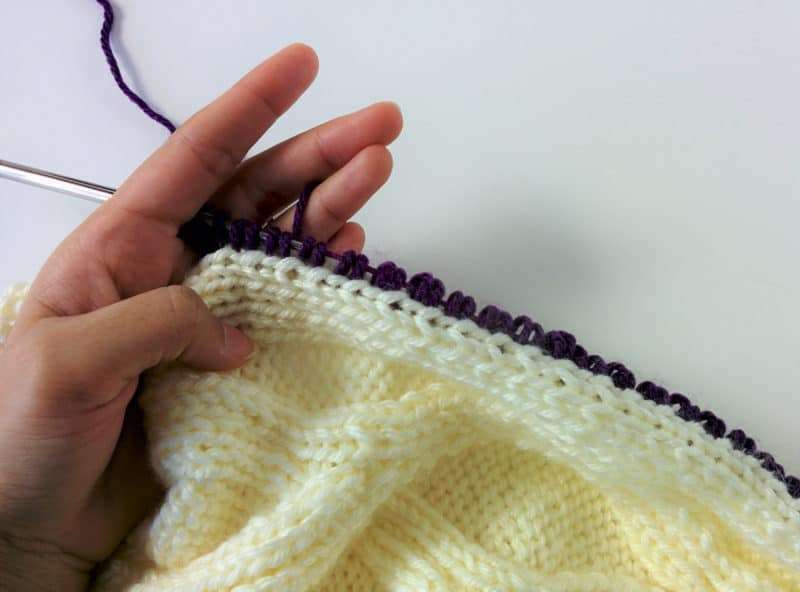 K2F/K2B – slip 2 stitches onto cable needle, hold in front and knit the next 2. Knit 2 off the cable needle. With the MC, cast on 190 stitches. Row 1: Purl all stitches. Rows 3-11: Repeat rows 1& 2 for a total of 11 rows in stockinette. End after a purl row. For the rest of the blanket, work this cable pattern to the end of the row. You’ll only be working this on the even rows (RS). 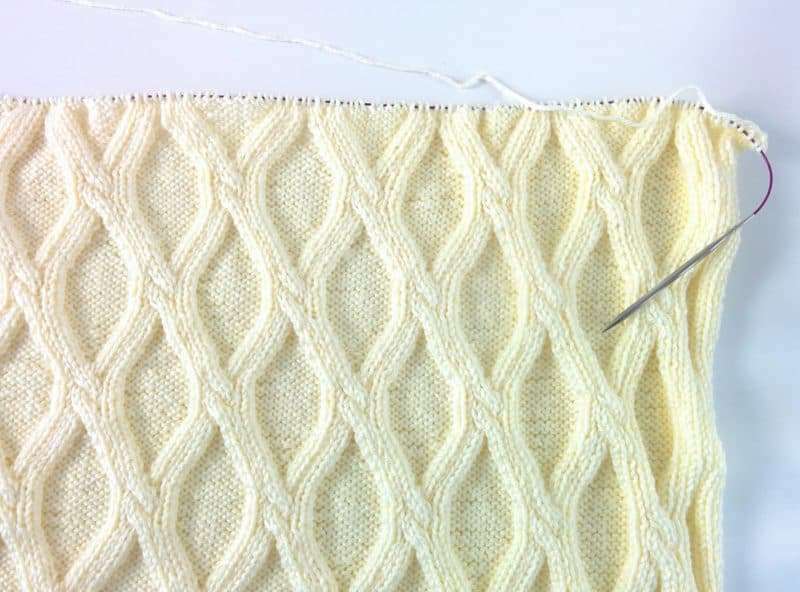 On all odd numbered rows (WS), work each stitch as presented. So, knit the knits and purl the purls. 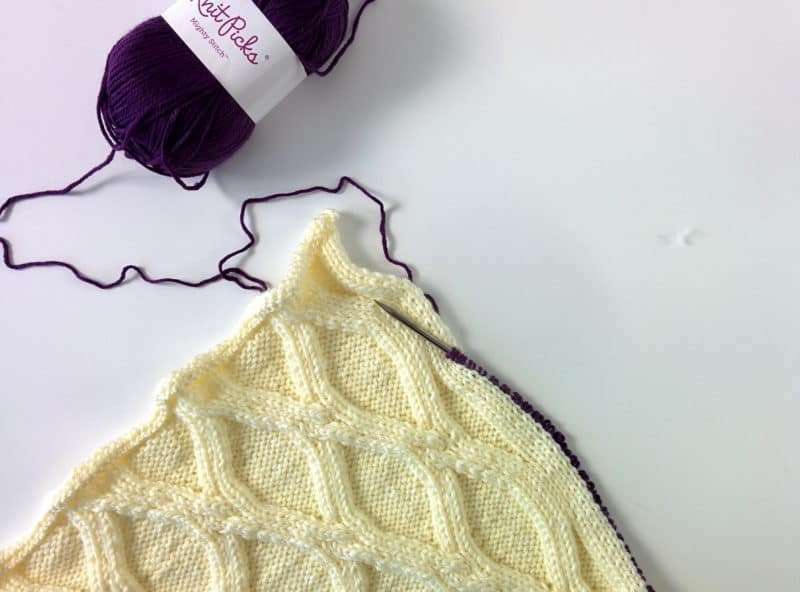 The first 5 and last 5 stitches will be worked in stockinette throughout the blanket to create a frame around the cables, and the bracketed instructions are your repeats. It helps to place a stitch marker after each repeat and the 5 edge stitches so you stay on track. For the first half of this cable pattern, your cables will move towards the center between the markers, then the cables twist and you’ll work outwards towards the markers. Row 12: K5, place marker, [(K2F/P1B) x 2, P8, (P1B/K2F) x 2, place marker], repeat everything in the [ ] until the last 15 stitches, then (K2F/P1B) x 2, P4, K5. Row 14: K5, P, [(K2F/P1B) x 2, P6, (P1B/K2F) x 2, P2] until the last 14, then (K2F/P1B) x 2, P3, K5. Row 16: K5, P2, [(K2F/P1B) x 2, P4, (P1B/K2F) x 2, P4], until the last 13, then (K2F/P1B) x 2, P2, K5. Row 18: K5, P3, [(K2F/P1B) x 2, P2, (P1B/K2F) x 2, P6] until the last 12, then (K2F/P1B) x 2, P, K5. Row 20: K5, P4, [(K2F/P1B) x 2, (P1B/K2F) x 2, P8] until the last 11, then (K2F/P1B) x 2, K5. This is where the cables twist! Row 22: K5, P5, [K2, P, K2F/K2B, P, K2, P10] until the last 10, then K2, P, K2, K5. Row 24: K5, P5, [K2, P, K4, P, K2, P10] until the last 10, then K2, P, K2, K5. Row 26: K5, P5, [K2, P, K2F/K2B, P, K2, P10] until the last 10, then K2, P, K2, K5. Row 28: K5, P5, [K2, P, K4, P, K2, P10] until the last 10, then K2, P, K2, K5. Row 30: K5, P4, [(K2F/P1B) x 2, (P1B/K2F) x 2, P8] until the last 11, then (K2F/P1B) x 2, K5. Row 32: K5, P3, [(K2F/P1B) x 2, P2, (P1B/K2F) x 2, P6] until the last 12, then (K2F/P1B) x 2, P, K5. Row 34: K5, P2, [(K2F/P1B) x 2, P4, (P1B/K2F) x 2, P4] until the last 13, then (K2F/P1B) x 2, P2, K5. Row 36: K5, P, [(K2F/P1B) x 2, P6, (P1B/K2F) x 2, P2] until the last 14, then (K2F/P1B) x 2, P3, K5. Row 38: K5, [(P1B/K2F) x 2, P8, (K2F/P1B) x 2] until the last 15, then (P1B/K2F) x 2, P4, K5. Row 40: K5, K2, P, [K2, P10, K2, P, K2F/K2B, P] until the last 12, then K2, P5, K5. Row 42: K5, K2, [P, K2, P10, K2, P, K4] until the last 13, then P, K2, P5, K5. Row 44: K5, K2, P, [K2, P10, K2, P, K2F/K2B, P] until the last 12, then K2, P5, K5. Row 47: Knit all the knits, and purl all the purls. Rows 48-288: Repeat rows 12-47 another 7 times to get the pattern. Rows 289-300: Work in stockinette (knit all RS rows, purl all WS rows) for 11 rows. Bind off all 190 stitches. 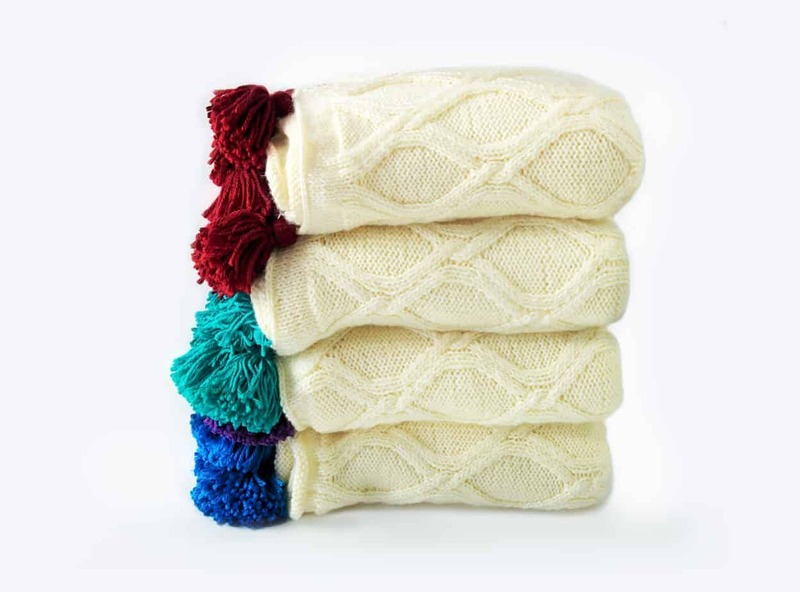 This chunky knit blanket pattern has a border only on the 2 long sides, and the other 2 sides have the tassels in a matching color. Hold the blanket sideways and with the same 5.50mm needle and the CC yarn, pick up and knit 2 stitches in the first space. Pick up and knit 1 stitch in each space and 2 in the last. It should be easy to pick up one stitch for each row you worked, plus our 2 extra, so you’ll have a total of 302 stitches. Rows 1-12: Work in the K2P2 ribbing for 12 rows and bind off in the pattern. 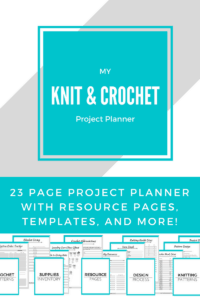 You’re almost done with your chunky knit blanket! Now, block the blanket to get the cable pattern to open up and stay flat. I have a full tutorial here on how to block knitting if you need help. Because this is a large blanket, I used my washing machine to let it soak a little and then spin out most of the excess water. Then, I pinned it flat to my blocking boards and let it air dry. In the meantime, I made the tassels. 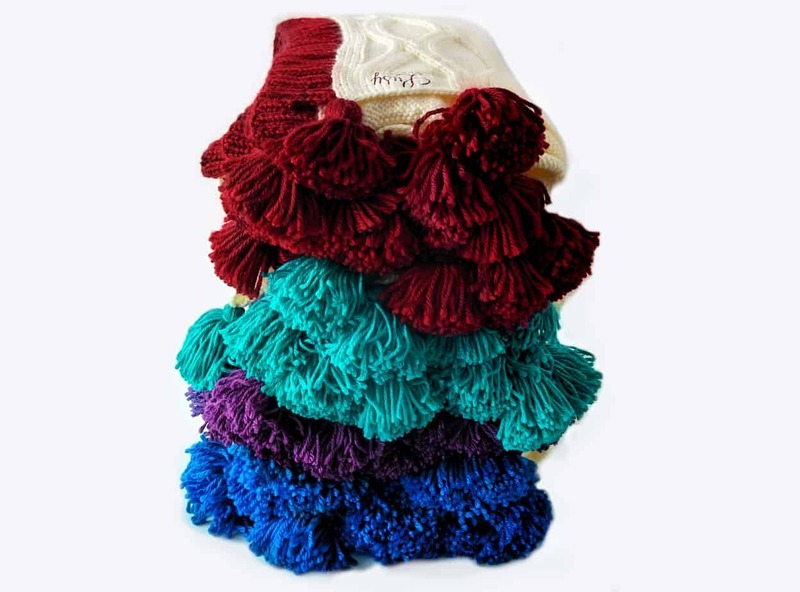 To make these tassels, I used the Lion Brand Jumbo Tassel Maker. You can also make tassels by hand, but this made it so much quicker and easier since I was making a lot of them and I wanted them to be exactly the same. Using the same yarn as the border, I set my tassel maker to the just below the 3rd setting (8.5 inches) and wrapped my yarn around it 35 times. Then I just follow the instructions on the tassel maker. For the loop it hangs by, I used cream embroidery floss so it would blend into the blanket. I used embroidery floss that matched the CC to wrap around the tassel to finish it. Lastly, I cut a 4-inch scrap of paper and taped it into a tube shape. I drew my tassel through the tube and lined up the edge of the wrapped section to the top of the tube. Then I trimmed the excess yarn so each tassel was even on the bottom and exactly the same size. I made 14 tassels total, 7 for each of the short sides of the blanket. 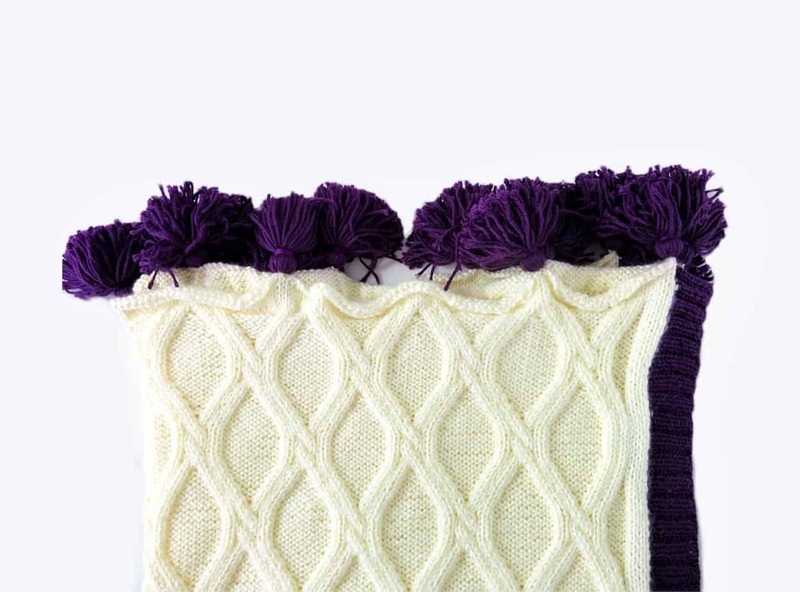 Space them evenly along the edge and sew each tassel onto the chunky knit blanket. And you’re done with the chunky knit blanket! I bought some custom iron-ons of the recipients’ names in the color of the blanket borders from this shop on Etsy. Although they aren’t recommended for use on acrylic and these blankets are 80% acrylic, they worked fine. I used similar letters on other blankets too and as long as you use low heat and another piece of fabric on top as you iron, you won’t damage the yarn. The transfer and the acrylic actually melt into each other a little and make them more secure. 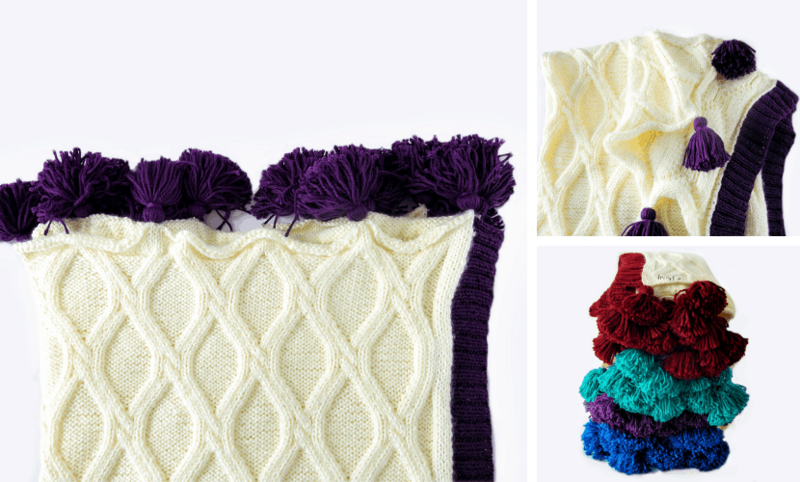 Let me know which chunky knit blanket is your favorite in the comments below. I love the purple because that’s my favorite color and that color combo is just so regal to me. Thanks so much for reading! If you liked this, be sure to subscribe down below to get updates, freebies, and new patterns every week! 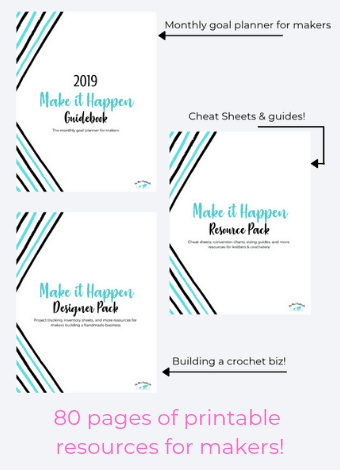 You’ll also get access to the resource library with freebie and bonuses. Oh my goodness, what a lovely cable design. 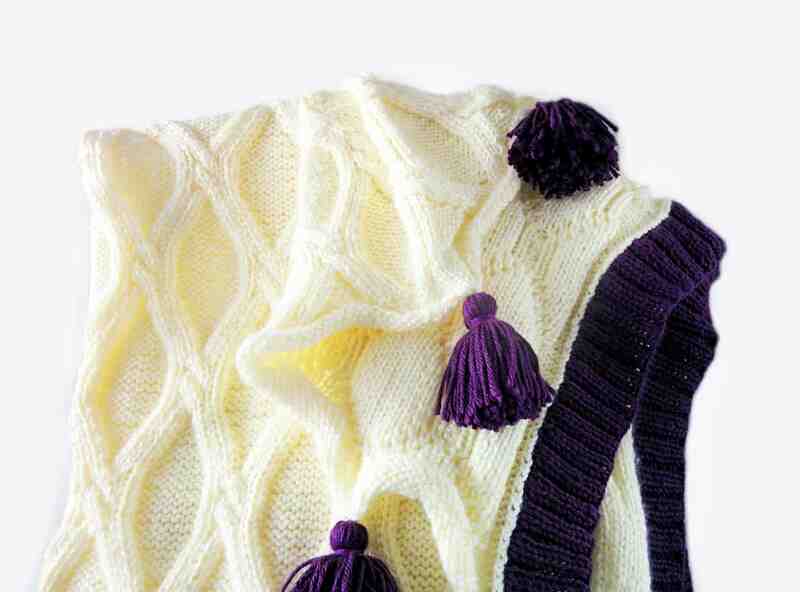 Cable knits were always my mum’s favourite, she made some amazing jumpers for us all over the years. Thanks! That’s such a sweet memory. 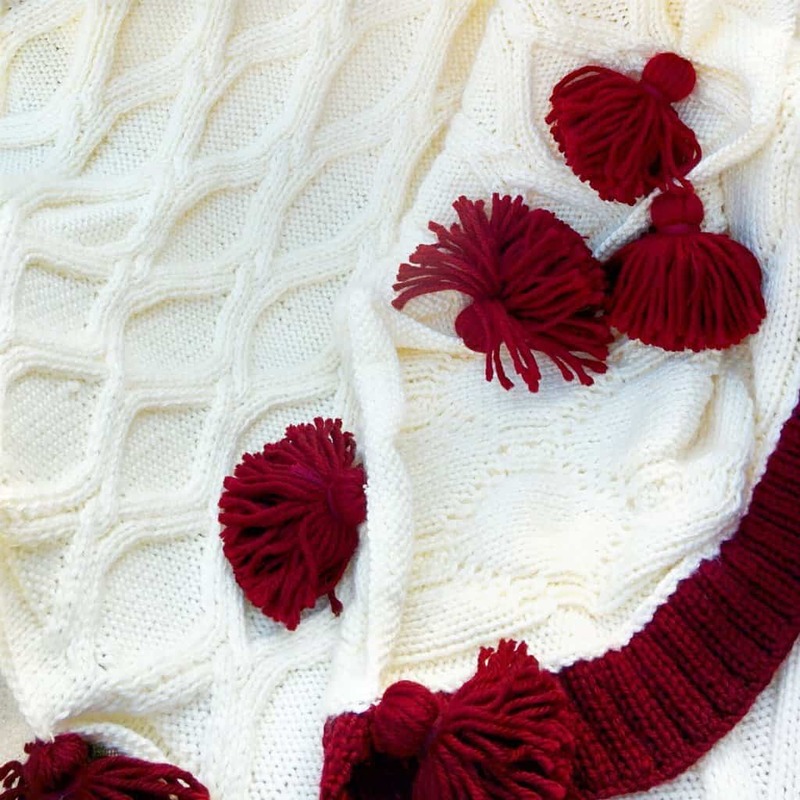 It reminds me of Mrs. Weasley and her sweaters :). I think this is only the second time I made something cabled (the first didn’t turn out so great), but cabled sweaters are on my list next!